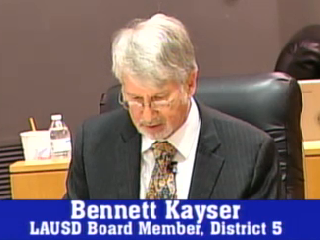 Minutes after voting against a motion to place an interim board member in the vacant seat on the LA Unified board, Bennett Kayser changed his mind, allowing the process to go forward. As a result, he broke the 3-3 deadlock and changed it to a 4-2 vote. A committee will form under Steve Zimmer to develop the parameters of the job and the application and to identify one or more candidates by March 3. Whoever is appointed will serve until voters select a new board member on June 3 or a runoff on Aug. 12, if the primary winner does not get more than 50 percent of the vote. The winner will fill out the term of the late Marguerite Lamotte, ending in mid-2015.